If there is any season of life that brings stress and anxiety to parents and kids alike, it’s these awkward in between years. Few of us look back on this time of our life with great affection. Braces, acne, bad fashion choices. You remember I’m sure. Unless of course you’ve blocked it out. As we watch our kids go through this phase, it can be painful. Sometimes we wonder if they (and we) will survive, let alone thrive. Part of helping them grow into the confident and capable young adults we know they can be is making sure they have the skills that are not only necessary to do well in school, but in life. 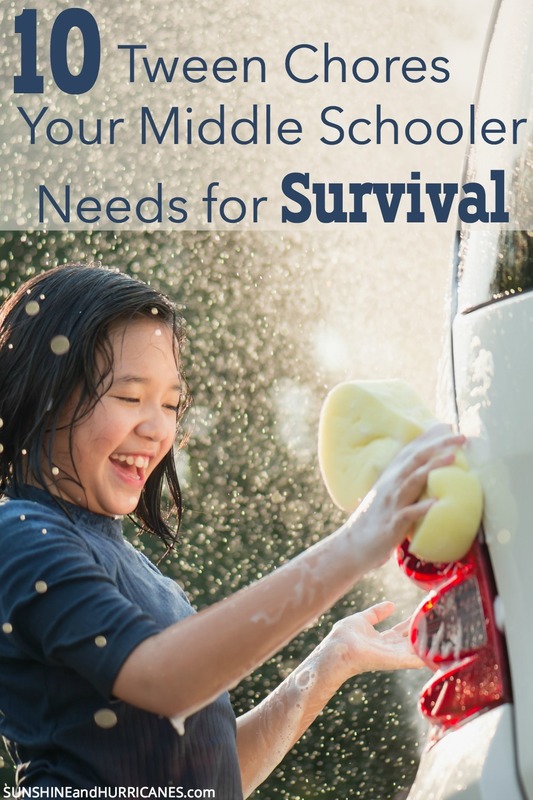 Having guided one child successfully through middle school and having another one on his way, I have come up with following 10 Tween Chores Your Middle Schooler Needs to develop those important life skills for adulthood. Technology is already a huge part of your child’s life and teaching our kids to use technology appropriately is our responsibility. Chances are, your son or daughter doesn’t need lessons in how their phone or tablet operates but they do need boundaries and safety instruction. You’d never hand the keys of a Ferrari to an unlicensed 12 year old but there’s just as much danger in handing over unmonitored access to technology. If you do move forward, have your child sign a cell phone contract. We’ve got a printable one that covers the basics for you in our post Cell Phone Rules for Tweens and Teens. This sets expectations and shifts responsibility from you to them. It’s an important step in developing accountability. Lastly, while some children are given access to social media in middle school, before you make your decision please read our post about What Every Parent Needs to Know About Social Media for Kids. Most social networks require or suggest a child be a minimum of 13 years old before joining. In our home, we have a tradition that when one of our kids starts middle school, they get their very own laundry basket! YEAH! Up until this point, they’ve had to help with doing laundry, such as folding and putting it away, but now they take on total ownership start to finish. This means, if they have a practice or game coming up, they need to keep track of whether or not they’ve got a clean uniform and if not, time to do some laundry. Also, mine wear uniforms to school too, so they have to stay on top of making sure they’ve got the proper clothes ready for each day. Now, I don’t throw them to the wolves. 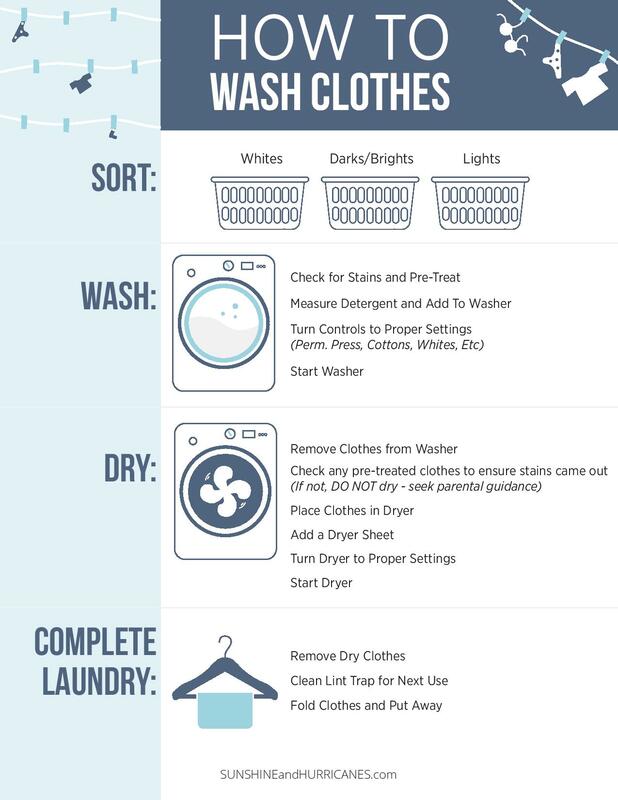 I walk through the laundry operations a few times with them and we’ve got a great printable that we’ve hung in our laundry room to help them in case they forget a few steps. Or you could do what this mom did…. I’ve heard from more than one parent that their Freshman college student is at a loss when it comes to knowing how often to wash their dorm bed sheets much less how one remakes the bed afterwards. Middle school is a great time to start this skill so it’s pretty much habit by college. Now that they’ve learned to do their own laundry, sheets can absolutely be a part of this new chore. General guidelines suggest sheets be washed every one to two weeks. Much of this is personal preference, so go ahead and have them follow your wash schedule on this one. But make sure they know that if they’re sick, bedding should be washed as soon as they’ve recovered to prevent germs from spreading or re-infection. Help them with the basics of making their bed the first few times and realize that they’re probably not going to care about hospital corners. After that, they’re on their own. You’re probably in the habit of functioning as your kiddos alarm clock but learning to wake up on your own is a definite skill, especially if you’re not raising a morning person. The day will come when you won’t be there to make sure they’re not snoozing through their morning math class or late for work. This is why figuring out what time they need to get out of bed so they can get ready and leave at a designated time is a good life lesson to start by middle school. It also helps them to realize the importance of sleep and how much easier it is to get going in the morning when you’ve gotten enough z’s. Tweens really need about 9 hours each night to be fully rested. Resist the temptation to save them from the consequences of not getting them up on their own. If they sleep through their alarm it could simply mean having to go to school without their hair done or having to miss breakfast or it might mean being tardy and a detention. Either way, it drives home the importance of being on time and will help them develop their internal motivation to mastering this skill. If you need a little help moving the process along and want to add a little creativity to this part of their morning routine, here are some unique alarm clocks, perfect for the tween or teen in your life. You’re probably so in the habit of doing this that it may not have have occurred to you to teach this, but there’s no time like the present! This simple task is perfect for your tween and gives you a few minutes to jam out to your favorite songs while he or she dealing with the gas pump. It’s also a quickie personal finance lesson. There is a good chance your kid has no idea how much gas costs or how often you need to fill-up. As they are getting ever closer to the day when they will behind the wheel of a car, making them aware of these details is a good starting point. Time management starts here. Taking responsibility for what time practices/games start, social events, appointments or school project deadlines are life skills that he’ll need to be a successful adult. We started with a large board like this one, in a central part of home so it was easier to keep track for all of us. After utilizing that successfully, it’d be a good time to switch to an individual planner or find a digital system that suits your needs. Breakfast and snacks are a great place to begin this training. Whether it’s frying eggs or an after school grilled cheese, using the stove top helps him or her work up to more involved cooking. We worked up to spaghetti, mac & cheese, browning ground beef and more as time progressed. I also gave my kiddos boxed brownies or cakes to learn the ropes of following a recipe, measuring, and general baking skills. I was hands off during this and left the kitchen so I could resist the urge to step in. Remember, basic cooking is a lifelong help and may even spark an interest in more involved culinary skills. And don’t forget to let them know they’re responsible for clean up, too! Need a few basic recipe ideas or a guide for meal planning? Check out our Pinterest Meal Planning Program. It’s got four weeks of easy, family friendly recipes tween and teens could handle and there are even printable grocery lists. We’re going to assume that your child has basic manners and the etiquette of “please” and “thank you” down by now. However, because children today spend way more time with screens and virtual interactions than you and I did while growing up, many are lacking some essential social skills. This is why we joke that my hubs is the handshake police in our family. Definitely from the school of thought that you learn a lot about a person in the way they introduce themselves, he started coaching our kids pretty young on this skill. Eye contact isn’t just important when shaking someone’s hand. We can help our kids in this area by encouraging them to look us as well as their siblings in the eye when talking. Also, when you are dining out, whether ordering from the counter or sitting down at a table, let your child tell the server what they would like to eat and make sure they look the person in the eye while doing it. Applying deodorant, styling hair, managing oral hygiene, especially if braces become a factor, and teaching good skin care are areas that need to be addressed during middle school, if not sooner. My daughter did almost all of this on her own, after guiding her in the process, and my son has done well but with more reminders and a definite learning curve. We’ve covered some of the tween chores that really help your child build life skills they will need as they move closer to independence. But basic and less glamorous chores, may of which they should already have been doing, also need to be continued. If you haven’t had your tween doing these chores, now is the time to start. Being a contributing member of their family is good for kids. It gives them a chance to learn responsibility and also to develop a work ethic. Many studies show that kids who do chores are often more confident, feel closer to their families and even do better in school. So don’t feel bad making them take out the trash. It’s good for them! 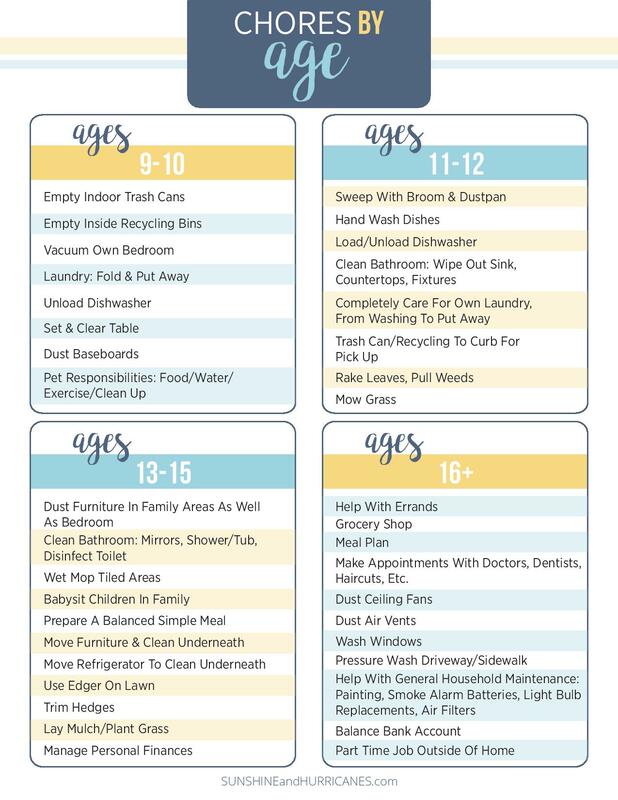 In case you’re not sure what chores are right at which ages, here’s a handy printable that will actually take you all the way through their teen years. 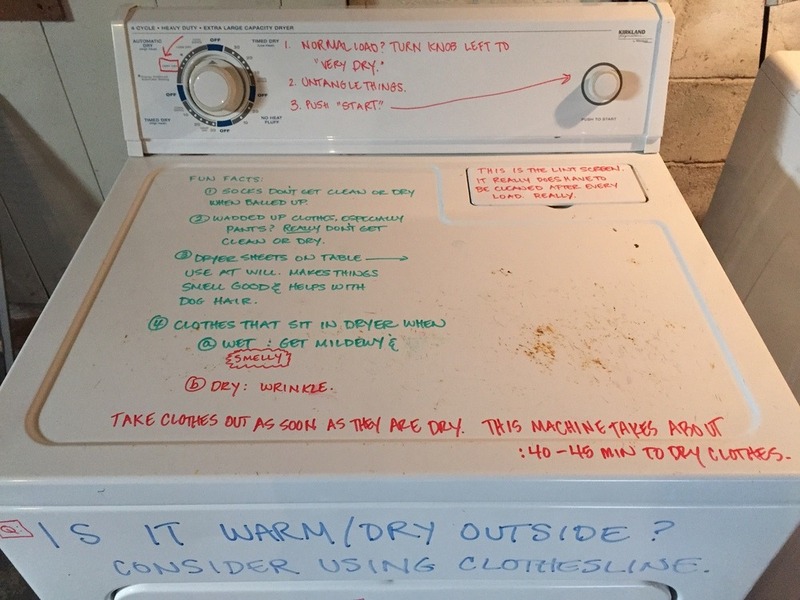 If you liked this post on tween chores, don’t leave without checking out these other ones…. 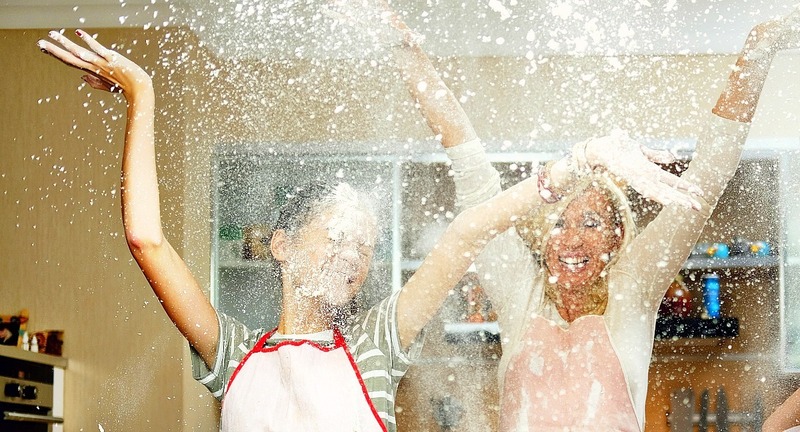 Are there any other tween chores you would add to this list? Chores on our list also include change any light bulbs and change the air filters. (They need a sibling to help safely negotiate the ladder.) If your kiddo isn’t ready for washing real dishes; start with washing the pets’ bowls. 🙂 Also, taking care of their own sports equipment: unpacking, washing, etc.